Isaac ORCHARD Esq. died quite suddenly, probably from a stroke or heart attack, on the 10th December 1832 whilst at the hustings in Bath. He had gone to support his preferred parliamentary candidate and was in the company of his youngest son, George Biggs Orchard, who would have been about 37 at the time. Isaac’s obituary in the Wesleyan Methodist Magazine of 1833 (p.155) described him as having been in his seventy-seventh year and hence his likely year of birth was about 1756. Isaac had been the District Treasurer of the church’s Missionary Society for many years. His obituary also recorded that he had suffered from a painful affection of the heart for a long time (angina?) and had often spoken of the likelihood of his sudden death with much composure. He had apparently undertaken his duties with ‘cheerfulness and punctuality’. Isaac’s death was reported in several newspapers in the South Western region in which he was variously described as having been urbane, intelligent, benevolent and kind. Isaac had worked as ‘an eminent and highly respectable auctioneer and upholsterer’, two apparently disparate professions which, for some strange reason, often went hand in hand in those days. Many advertisements appeared in the local Bath Chronicle & Weekly Gazette for ‘Mr Orchard, cabinet-maker, upholsterer and auctioneer’, with premises at 6 Margaret’s Buildings, a pedestrian walkway off Brock Street, near Bath’s famous Royal Crescent. The first such advertisement appeared in Bath in about 1787, when Isaac would have been just past thirty. A marriage took place in Devizes, Wiltshire on the 7th November 1778 between Mr Isaac Orchard and Miss Anne REX a young lady formerly of the parish of St James in Bath. Isaac was ‘of the parish of Devizes’. As a young man of twenty-two, he may have just finished an apprenticeship in that town. Indeed, a witness to the marriage was Robert LYDFORD, a cabinet maker, as Isaac himself became. The couple moved to Bath and the first of their five children, Anne Orchard, was baptised on 13th May 1781 in Walcot. Lydia followed in 1782, Joseph in 1784, then Isaac in 1785, another Joseph in 1788 (the first having presumably died) Mary in about 1790 and finally George Biggs in 1795. Why George Biggs Orchard was so named is a mystery. The Bath Corporation Deeds Collection at the B&NES Record Office contains a number of documents relating to property transactions involving Isaac Orchard of Bath, cabinet maker. The earliest is the lease and release of a messuage in Kingsmead Terrace in 1791; a house that passed hands several times between Isaac, timber merchant and builder John BAKER and other parties. Later, in 1797, a messuage in Ballance Street in Bath was conveyed to a widow from Warminster by John CHERINGTON, a carpenter and Isaac Orchard, who was acting as one of two executors of the will of a Martha Orchard, executrix of her late husband Abraham’s estate. Abraham was said to have been a ‘gentleman’. The other executor of Martha’s will was Thomas MILLS, a Bristol bookseller. Unfortunately, most Somerset wills were lost during WW2 when the repository in Exeter was bombed. However, the deeds collection shows that the house in Ballance Street had first come into Abraham’s hands on the 10th March 1792. What was Isaac’s relationship to Abraham and Martha? Who were they? Isaac’s son Isaac matriculated at Magdalen College, Oxford on the 24th May 1817 aged 31 years. The record confirms that he was son of Isaac Orchard gentleman of St James, Bath. The Baptist Magazine (January 1829 vol. 21, p.161) tells that “Rev Isaac Orchard, late pastor of the Independent Church, West Street, Walworth has, at the request of the Baptist Church at Lambeth, published the sermon which he preached on Dec. 28 1828, immediately before receiving the ordinance of Baptism”. So, Isaac Jr, after a few years in business as cabinet maker and auctioneer like his father, became a Baptist minister. At some point in the early 1830s, he took his family to New York where they settled. Isaac remained a minister and can be found in the US censuses of 1850 and 1860. For all these facts and anecdotes about Isaac Orchard Sr, who was this man and from where did he originate? He was born in about 1756 and yet there was no baptism to be found in Bath parish records. Perhaps he was not baptised or his baptismal record is missing; maybe he was not local to Bath or perhaps Isaac was born of non-conformist parents – certainly as an adult he appears to have been a Methodist. Fortunately, Isaac’s will survives and is in Somerset Record Office. It was written on the 12th May 1827 and is quite detailed. He wished to be buried with his ‘dear late wife’ (in Walcot) and appointed three executors to administer his estate. He left a clothes cabinet, which he’d made in 1776, to son Isaac along with all his clothes and the majority of his books plus he gave a silver watch and seal to young Isaac’s son. The majority of household goods were gifted to daughter Anne, wife of Thomas HARDING, on payment of £50 to the estate. She also received Isaac’s bible ‘with Clarke’s notes’. Clarke, I discovered, was Methodist minister Adam Clarke, a man who spent forty years annotating the Bible according to the church’s beliefs; a work which, when published in 1831 would become a seminal Methodist text for many years to come. Isaac’s bed, bedstead and much of his other furniture was bequeathed to daughter Mary, wife of Moses Lewis GAY. She was also to receive his household linen and tableware plus thirty-two volumes of ‘Wesley’s works’ – I hope she lived in a big house! Interestingly, Isaac called in all moneys owed by his three children so that the estate could be shared equally amongst them. As for George Biggs, Isaac’s youngest son he and his father had run the family business together but, with Isaac’s retirement, their partnership was dissolved in 1827 on Lady Day (a common contractual date). George was now instructed to pay back to Isaac’s executors various sums of money that he had owed his father. If he did this as directed then he too would receive a share of the estate but, if he defaulted, then he would not. Clearly, however tortuous this process seems, Isaac wanted to make sure that his children were treated without favouritism. To me, the most informative part of Isaac’s will relates to three freehold tenements or dwelling houses, with warehouse and appurtenances in Back Street, Bath occupied by George BRYNE. If, when Isaac died he possessed these houses under the terms of his late mother’s will, then he could bequeath them to his oldest son. In explanation, Isaac named his two sisters Mary, wife of Robert Evans CHAMPION and Lydia, wife of John BAKER (the builder) and said that whichever of the three of them survived would inherit their late mother’s property. This is interesting, not just because Isaac identifies his sisters and their partners, but because there are a few newspaper references in Bath to a Jacob Orchard, gingerbread maker and confectioner, who had a shop in Back Street. Jacob and his wife Mary had died in 1792 and 1812 respectively. They were buried in Quaker burying ground at Bathford. Here then is a non-conformist couple who perhaps were Isaac’s parents. Perhaps it’s no coincidence that the marriage of Mary Orchard and Robert CHAMPION in 1774 was witnessed by a Jacob Orchard. The other witness was Abraham Orchard. Again a reference to Abraham – who was he? There was a marriage, at Clerkenwell St James, London, of an Abraham Orchard and Martha BISHOP on 5th December 1775. I have found an unsourced date of birth for Abraham of the 18th October 1753 which, if true, would mean the man was married at the age of twenty-two. Both parties were said to have been of that parish. 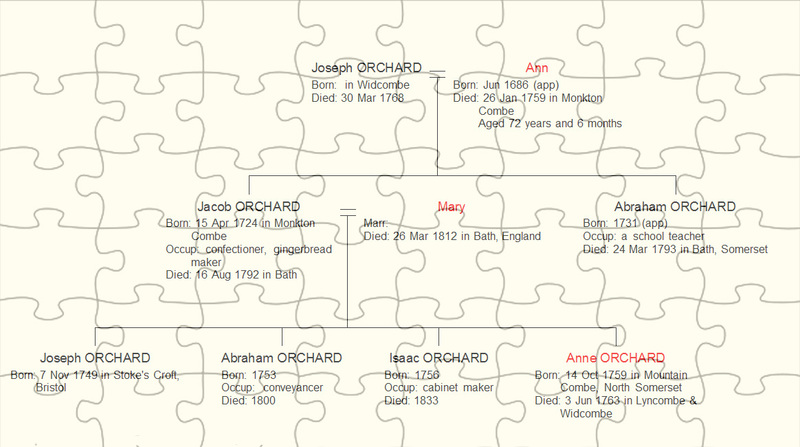 This may be the Abraham and Martha Orchard that had a family in Bath. If so, their children were baptised: Ann Bishop (1776), Mary (1779), George (1780), Abraham (1781), Ann Bishop (1785), Lydia Eleanor (1787) and George Randall (1792). Interestingly, this last baptismal record was annotated by the parish clerk recording that a man present at the baptism deposed that the baby’s given names he had heard spoken were George Randall, not George Rudhall, as written in the register. The witness was an Isaac FROHARD. Perhaps this should have read Isaac Orchard? On the 21st February 1827, Abraham’s daughter Lydia Eleanor, then just forty years old, died in Nantyglo, Aberystryth, Monmouthshire. She had married John SWAIN Esq. who was connected with the ironworks in the town. Her death notice stated that she was the only daughter of the late Abraham Orchard Esq. solicitor of Bath. A separate, similar, report of the marriage described Abraham as ‘an eminent conveyancer of this city’. So, Abraham had dealt with legal transfers of real estate in Bath. Presumably, the reference to Lydia being the only daughter meant the only surviving daughter at that point and, indeed, there are burial records that suggest the early deaths of the other girls and of three boys. Abraham Jr seems to have moved with his sister Lydia as his death at Ivy Cottage, Nantyglo was reported as 23rd November 1848, aged 67 years, thus matching his 1781/2 baptism. He was connected with both iron and coal industries. Abraham and Martha’s youngest son, George Randall Orchard, has the highest visibility on the internet. He was admitted sizar (a student on a bursary) at Christ’s College, Cambridge on the 29th October 1818 from Magdalen Hall, Oxford, at which he had matriculated, aged 23, on the 14th January 1815; a ‘Ten-year man.’ (NB. Isaac Orchard Jr entered Magdalen too, in 1817). George became the perpetual curate of Christchurch in Road (later spelt Rode) Hill, Bradley in Wiltshire on 24th September 1826 in which capacity he died on the 21st June 1850 aged 57 years. So, Abraham was a gentleman, solicitor and conveyancer in Bath and he and his wife Martha had at least three children that grew to adulthood and prospered, two of them moving to Wales. 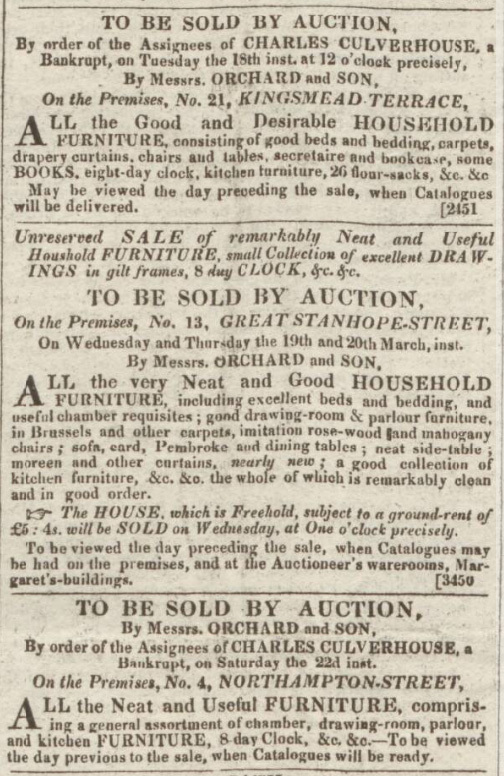 From about May 1789, the Bath Chronicle and Weekly Gazette displayed several advertisements for the selling of British Tontine shares by ‘Mr Orchard of Chapel Court’ and also property sales for which the ‘particulars could be obtained from Mr Orchard, 4, Chapel Court’. 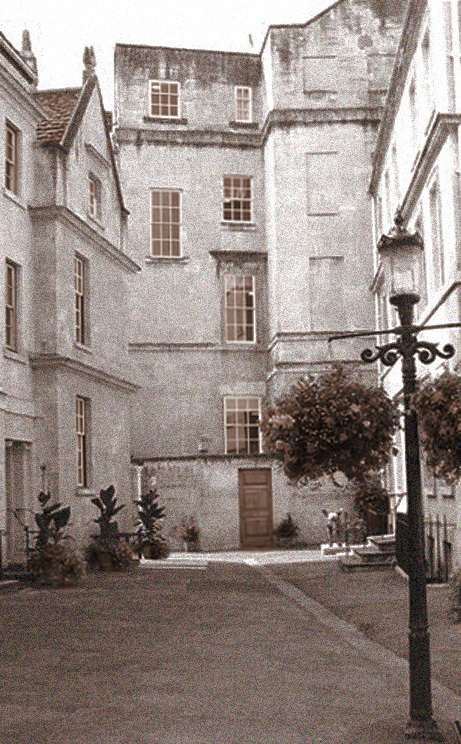 Chapel Court is a pleasant courtyard complex, located near the Cross Bath in the centre of the city. In the Court is St John’s Hospital, possibly one of the oldest almshouses in Britain, established in the 12th century. The present buildings date to about 1715 and today provide accommodation for ninety elderly residents. In 1791 and 1793, notices were put in the Bath Chronicle and Weekly Gazette advertising for persons with an interest in the estate of the late Rev Walter CHAPMAN DD, rector of Bradford (on Avon) and master of St John’s Hospital in Chapel Court. The executors and devisees were Mr FAULKNER in Bond Street and Mr Orchard in Chapel Court. A 1792 Gloucester deed of other properties belonging Dr Chapman’s estate names the executors more fully as Samuel Faulkner, wine merchant and Abraham Orchard, gentleman. Chapel Court is a recurring theme it seems. The complex is small and so it is probable that Walter Chapman and Abraham Orchard knew one another and may have been friends. Something interesting happened with Walter Chapman’s will because he had bequeathed a property to Abraham and Samuel which had caused complications with Walter’s family. The ensuing legal case was written up in a law review which incidentally stated that Abraham died in 1800 and Samuel in 1803. But, even with a given year of death, I have not been able to find any record of Abraham’s burial, nor was his passing recorded in the press, eminent though he was said to be. Like Isaac Orchard the cabinet maker, Abraham’s birth may have been of non-conformist parents. Could Abraham also be a son of Jacob the Quaker gingerbread maker and therefore Isaac’s brother? Maybe, but if Isaac was administering the will of Abraham and Martha in 1797, this couldn’t be Abraham the solicitor. But if not he, then who were the ‘other’ Abraham and Martha? In August 1785, the Bath paper reported the formation of a committee to raise funds for establishing Sunday Schools in Bath with a view to giving selected poor children an education within the framework of the church. The secretary of this committee was ‘A Orchard’ with no further identification or address. As the charity’s funds built up over the years, an Industrial School was opened in the parish of St James, a place in which young, poor children could be taught practical skills and receive religious instruction. The scheme paid for the employment of several schoolmasters and mistresses and, as far as can be ascertained, was run by the Anglican Church. In 1793, the death of ‘Mr Orchard, schoolmaster’ was reported. It had occurred on 24th March. Five days later, on the 29th March 1793, Abraham Orchard was buried at Bathampton Church but no further details were recorded. On Thursday 18th June 1795, the Chronicle’s local news of the previous day, reported the death of ‘Mrs Orchard, relict of Mr Orchard, late schoolmaster’ on the Wednesday (of the previous week presumably). Going back to Bathampton, there was a burial of Mary (not Martha) Orchard of Bath on the 14th June 1795. 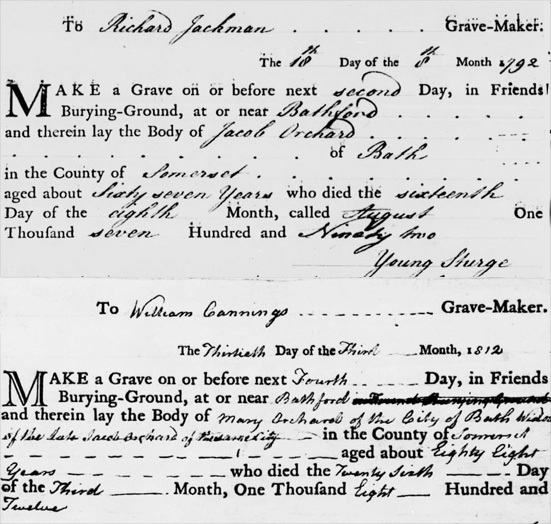 Perhaps these burials are a mere coincidence and maybe the schoolmaster and his wife weren’t the Abraham and Martha/Mary whose estate was administered by Isaac in 1797 but no better candidates have come to light. So, perhaps Isaac the cabinet maker and Abraham the conveyancer were sons of Jacob the gingerbread maker; is there anything about Jacob that may help to confirm or deny their relatedness? Jacob had lived in the village of Monkton Combe on the outskirts of Bath. Property records suggest he also leased a three acre wood in Twerton – possibly a renewable source of fuel for his baker’s oven? Jacob’s many siblings were born in the village too, their births were recorded at Quaker Meetings. The youngest child was Benjamin, born in 1727. Or just maybe, the schoolmaster Abraham (born in about 1731, according to unsourced information) was another child, in which case he would have been the uncle of Isaac and Abraham. Jacob and his many brothers and sisters were the children of Joseph and Ann Orchard. Joseph was the son of Tobias, who was the son of Tobias, who was the son of Thomas Orchard of Widcombe (b. 1576). More of them another time. Jacob and Mary may have had at least two children: Joseph, born in 1749 at Stoke’s Croft, Bristol and Anne, born in 1759 at Monkton Combe (both in Quaker records). Plenty of space for two sons born in 1753 and 1756 perhaps?! All of this interconnectedness is hypothetical and there may never be any evidence one way or the other. Where are the birth records of Isaac the elder and both Abrahams? Why was Martha buried as Mary? Why wasn’t Abraham the solicitor’s death reported in the papers? Where were he and Martha buried? Did they go abroad, like young Isaac? Was Isaac the Oxford graduate the son of Isaac the cabinet maker or of some other Isaac? Are Abraham and Isaac brothers? On the plus side: the men are close in age; Abraham sold houses and Isaac sold house contents; both were Methodists; both perhaps had sons at Oxford at the same time who would one day become ministers; both named their children Ann, Mary, Lydia, a namesake and George with a middle name; if Isaac and Abraham were both sons of Jacob, their brother was Joseph – the names of the four great men from the book of Genesis. Coincidence? This entry was posted in General and tagged Abraham ORCHARD, auctioneer, cabinet maker, conveyancer, gingerbread maker, Isaac ORCHARD, Jacob ORCHARD, Joseph ORCHARD, Rev Walter CHAPMAN. Bookmark the permalink. Your posts are very interesting and a joy to read – so much research and time involved. i came across this post as i have been doing a little research into Benjamin Guinness Orchard who wrote and published the Liverpool Legion of Honor in 1893. Benjamin was a son of George Biggs Orchard and born in Bath in 1834 (no baptism found online). Benjamin had a rather tragic life, in 1879 he was sentenced to 5 years in prison for attempted murder of two of his children and attempted suicide. It is clear that he must have had some form of mental breakdown. There is very little information about his early life but through the material available online it appears that his mother died during childbirth in 1837 and his father then remarried (for the 4th time) in Lincoln in 1840. Benjamin and his young sister were living in London in 1841 with a Roberts family who I think were the maternal grandparents family. I have not been able to find Benjamin or his father in the 1851 census but George Biggs reappears in Bebbington in 1861 and living not far away from Benjamin who is working as a clerk. I can only assume that he was away at school in 1851. The family were clearly people of standing – the maternal grandfather was described as Independent on the 1840 census. Unfortunately although Benjamin had talent as a writer and had for some time his own newspaper in Liverpool he went bankrupt in the 1870’s and was clearly in financial trouble during his time in prison – it seems that he had some supporters who helped his wife and family. He does not appear to have left a will. So far I have only been researching on the internet and hope to visit Wirral archives in the near future to see if they have any more records or information. Your information has been very helpful – it clearly shows his family’s background. Like his grandfather Issac Benjamin was keen to serve his community – he was the secretary of the Clerks Association and the Christian Mans Association. When Benjamin married the service was in an Anglican church – half of his children were baptized in Catholic churches, his wife was probably Catholic. I wonder if this was one of the issues effecting his marriage and subsequent breakdown. I expect we will never know!. Hi i have just read this wonderful story which includes my 5x great grandfather Abraham Orchard ,and finally information of were he finally came from i am so overwhelmed with all the information you have provided i knew Abraham was never born in wales Ivy cottage, although thats were his family seemed to remain for nearly 100 years. This as been a massive breakthrough in my family research because as you no its awful when you seem to come to a dead end , i am aware of him being a methodist as i have a copy of his will which states many books on methodism which were left to various children , i beleive my 5x great grandfather was married before he may have come to wales and had three children as stated in his will before he married a susannah Knowles. i would love to know more and can be contacted on kathwinter2001@yahoo.co.uk . An Isaac Orchard married Sarah Cox Dear at Lyncombe and Widcombe on March 5th 1832. They were my 3rd great-grandparents. I am not sure whether I can link this Isaac to the family in your blog, but there are similarities. However a little about what happened to them. Their daughter, Sarah Cox Dear Orchard (you get all the maternal surnames for free) was born in Marylebone in 1834. Indeed Isaac gives his parish as Marylebone at the marriage, Sarah was from Chelwood, Somerset. But in March 1839 Sarah Cox Orchard (which is the mother) married Henry Barber, a tin plate worker (I think owner of a tin plate works in John Street, St. Pancras, in partnership with Thomas Piggott) in Marylebone. I am not 100% sure what had happened to Isaac Orchard, except that an Isaac Orchard aged 27 was buried in Bunhill fields in 1833. If this is him he did not live to see the birth of his daughter. Bunhill fields is very much a nonconformist cemetary, John Bunyan, Susanna Wesley and Isaac Watts are buried there. Sarah had one son with Henry Barber, who I think died aged 2 in 1843, he is not there in the 1841 census. Sarah Cox Dear Orchard does not seem to have been part of the lives of the Barbers much, I cannot find her in 1841, in 1851 she was living with her uncle and aunt John and Cornelia Colley (Cornelia nee Dear), in 1861 she was back with the Barbers, who also had a lodger, Alfred Peacock Wakeman, whom she married the following year. Anyway I don’t know whether my ancestor Isaac Orchard (c. 1806 – probably 1833) is connected to your family, but there certainly are indications that he was like them a nonconformist. OK – had a moment to look at my records but, although there are obvious name similarities, I can’t place your family within my family group, unfortunately. The non-conformist records seem to suggest that ‘your’ Isaac may have been the son of Samuel and Anna ORCHARD, born on the 28th December 1806 and bp. 20 August 1807 by Rev. Wm JAY in Bath. This couple had other children, mostly girls, including an Anna and a Mary – both of these names are mentioned in the will of a Samuel Orchard, gentleman who died in 1849 (although living in the Isle of Wight he was ‘formerly of Lyncombe & Widcombe’). It would appear from this document that perhaps only three daughters had survived – Anna (who married a Mr Pretor), Mary and Eunice (both spinsters). Samuel didn’t mention a wife. I found the marriage of Samuel Orchard and Anna Eliza PHILIPPS at Walcot St Mary’s Chapel on the 23rd December 1801. Assuming that the groom may have been a young man (? 70 years or less at death) I looked for and found the baptism of a Samuel Orchard on the 30th August 1782 in Walcot St Swithins to Isaac and Mary. From that, I found a marriage of an Isaac Orchard and Mary CHAMBERLAIN on the 17th December 1781, also at Walcot St Swithins. IF any of these details are correct, then this is why I cannot place your family – I do have an Isaac at exactly the same time frame as yours but he was married to Ann REX, as you may have read. It is, of course, possible that your Isaac was the son of another member of ‘my’ family that I have not previously researched – if you find anything out I would be very interested to know! Sorry, mistyping, the son, Joseph Barber, was there in the 1841 census but he was not there in 1851. There are two deaths of Joseph Barber in 1843 in St. Pancras, where they lived in 1841. Isaac Orchard, Jr., was the father of my great-great-grandmother on my father’s side. She was Mary Eliza. Her American husband pastored a church, for a time, near where I live (in the U.S.), and though her husband left this area after her death, their teenage son did not, nor did his descendants. Thank you for this wonderful work!